Thérèse lived this out in every aspect of her life, but it was especially evident in her approach to suffering. What Thérèse understood, perhaps more than any other soul in modern history, is the infinite love that God has for each one of us, regardless of his or her physical capabilities or situation in life, and that this love alone is what gives value and meaning to every human life. Afflicted with tuberculosis at a young age, a disease which not only caused her much physical pain, but also crushed her dreams of ever becoming active in the foreign missions. 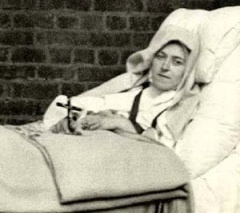 However, St. Thérèse did not allow such afflictions to also crush her spirit. Instead, she threw herself into the open arms of suffering and persevered under trial for the sake of God’s love and for the salvation of souls. Certainly God does not will suffering, which is a consequence of Original Sin. But in His infinite love and desire for souls He makes use of everything, including sickness, poverty, even our own failings so that we may grow closer to Him. Suffering should be remedied whenever possible, but it is a part of life and a culture that expects life to be lived to its fullness must be able to embrace and make peace with—even find joy in—the normalcy of human suffering. Our task as Christians is to show the world its folly by imitating the example of saints like little Therese who took Christ’s words seriously (Mt. 16:24, Lk. 9:23) and, like St. Paul (2 Corinth 12:10), was content in her weakness and rejoiced in her suffering. The crosses that we carry are our keys to heaven, if we let them be, because they purify us (1 Peter 1:6-9) and produce perseverance (James 1:2-4). They remind us that we are creatures and totally dependent on God and teach us humility and self denial so that the power of Christ may more easily dwell in us (2 Corinth 12:9-10). O Jesus, Your little bird is happy to be weak and little. What would become of it if it were big? Never would it have the boldness to appear in Your presence, to fall asleep in front of You. Each one of us is small, tiny, before God. My spirit resonates with St. Therese, the “little bird”, who knows her weakness and insignificance. If I climb mountains, I remain small; if I travel the seas, my smallness follows me. We have nothing to boast before God. If St. Therese, a Doctor of the Church, knew this, then who are we to think more of ourselves?